Is your dog eating feces? Is your dog eating feces? His own or others? Well, it might sound strange, but it is more common than you think, and especially in small breed dogs like the Shih Tzu. This revolting habit may be more common than you expect because normal people have better things to do than to discuss such matters and let's face it, well would you want to talk about it over a family dinner or romantic night out? Even though it seems nasty or disgusting to humans, the habit of dogs eating their own stool or the feces of other animals has a very natural explanation that goes back in time to early dogs. That is one theory, but I'll be covering other possibilities in just a moment. Many puppies pick up the habit from their mother at a very young age. When puppies are first born, they cannot defecate or urinate on their own. Mother dogs must stimulate their newborns to defecate and will then clean their nursing puppies and eat the feces. This canine behavior goes back to when dogs were evolving from wolves. It is still seen routinely in wild wolves and dogs. With pups in the den, the mother would remove the feces of her young by eating it to keep the area clean, but also at the same time; she would do this to avoid any smell that might be picked up by a predator. Since dogs are pack animals, other adult dogs in the “canine” family will sometimes help in rearing the young and help keep the den clean through the same process. So through evolution, dogs eating feces is quite customary from a dog’s point of view. As puppies mature and begin eating food, the mama dog often relaxes and relegates her former cleaning chores to the breeder, but not always. The most finicky dams will continue to clean up after her pups. We don’t know whether this repeated behavior becomes hard-wired into her brain or the result of instinctual behavior. Her insistence on cleaning seems to persist and her offspring observe the habit and may continue. In my experience, those puppies who end up with the habit have mothers who were unusually fastidious. Many puppies outgrow this behavior by six months of age with mild discouragement from their owners. A few dogs continue to ingest their own or other dogs’ feces into adulthood. Some of these dogs are highly motivated and the behavior seems to become compulsive. From my own experience with a "herd" of Shih Tzu dogs, my girls are much more likely to eat feces, theirs and others than the boys. Could that mean that their is some maternal instinct that causes dogs to insist this habit is appealing? There are other reasons for dogs eating feces. Sometimes, dogs are severely punished for leaving “surprises” in the house. These dogs may develop a mental connection that they will be punished if their humans find them in the same room with feces. Dogs react by eating the feces so it will not be there to make the human angry. Other dogs that are punished will hide their feces such as defecating behind a sofa or in another room that is not used. This is one of many reasons not to use punishment when house training a dog. Is Your Dog Eating Feces? Maybe she is bored! Boredom could be another possibility. 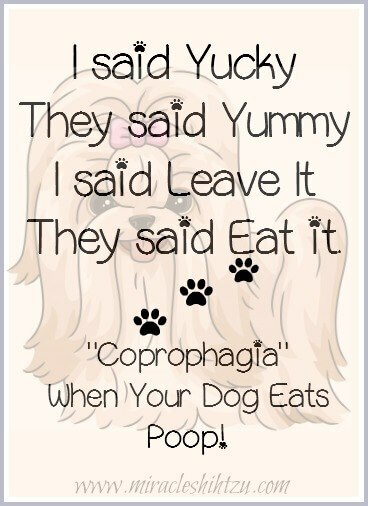 Dogs with limited interaction with other dogs or their owners can lead to coprophagia. Bored dogs do all sorts of unacceptable things, including eat feces. This is common in puppies who are crated or confined to small spaces with little interaction. Interesting toys that have treats inside them for the dog to get out can help with lots of boredom-based problems. This is another behavioral cause that can result from boredom, but can also be associated with anxiety, separation anxiety and stress. Dogs may do just about any wild thing when suffering from separation anxiety. If the dog eats the feces when the owner is away, this too could be a possible cause. Dogs with separation anxiety need to work through this problem before you can tackle the poop eating. Medical problems can entice dogs to eat feces even if they were not engaging in this behavior prior to their eating theirs or others stools. Poor diet, malnutrition or not eating enough food could lead a dog to eat feces. Nutritional deficits are not as common in dogs that eat a commercial diet. Most of the basic nutritional needs are met on a commercial diet. Homemade diets could cause a problem because the average dog owner who cooks for their dog could create a diet that is not nutritionally complete. Intestinal parasites could cause a dog to eat feces because the parasites are robbing the dog of vital nutrients and normal digestion and absorption is not possible when the dog has parasites inhabiting their intestinal tract. It is possible that dogs get some nutritive value from eating feces. It is hypothesized that eating garbage and human feces was one function of dogs during their early domestication, some 12,000 to 15,000 years ago. They served as our first waste management workers, helping to keep the areas around human settlements clean. A dog that is chronically hungry, meaning that they are not getting enough to eat or going too long between meals may eat feces. Even a dog that has plenty to eat may have a dietary deficiency because the quality of the food is poor. Your veterinarian can help you evaluate the dog's weight and can suggest a feeding schedule and amount. Sometimes it takes experimentation to see what works best for a particular dog. A dog with a physical problem such as a condition that prevents the proper digestion of nutrients in the food could consume feces. Some problems can cause excessive hunger, pain, or other sensations that may lead to eating feces. If your adult dog that has not previously had this habit suddenly develops it, take the dog to your veterinarian for a check-up. Although very rare, it is worth the trip to the vet. It may not be the nutrients that the dog is lack but rather the enzymes that digest the food. This popular theory states that dogs who eat their feces are actually trying to consume the digestive enzymes in the poop. To support this, there has been some success from simply adding a digestive enzyme supplement to the coprophagic dog's diet, and/or the diet of other dogs in the household. Depending on the reason for coprophagia there are some ways to curb this nasty problem. The number-one thing you can do to help overcome feces eating is to keep your dog's area clean of feces. This means house training, and supervising the dog whenever the dog is in the designated relief area. It is not healthy for dogs to eat feces but in most situations, it will not harm them. However, it is definitely unpleasant for their human owners so preventing the dog from carrying out the habit is the first step towards getting the habit to fade. It is not healthy for humans or dogs to have the feces lying around. Until a dog is fully house trained and the feces-eating habit has died out, picking up after each bowel movement is an important tactic. After the dog's habits are steady, you may be able to pick up just once a day if you have a private place for the dog to use. Sometimes, changing the dog’s diet will help reduce the problem. There does not seem to be any one food that is right for all dogs, and your dog may need something different than you are currently feeding. Be sure to make any changes of diet gradual, mixing the new food in with the old over a period of several days or weeks, to give the dog's intestines time to adjust and avoid diarrhea from the change. Add something to your dog’s diet to prevent your dog eating feces. Some people add food additives to stop a dog from eating feces. Sometimes the theory is that the additive provides a nutrient the dog is seeking when eating feces and thus the dog will no longer crave feces. Other times the theory is that, the additive makes the feces taste bad and the dog will not want it. One example that often works is pineapple. You can add a bite of pineapple to the dog’s food or feed it directly as a treat. Another idea is to feed your dog broccoli, cabbage, or Brussels sprouts. The idea behind these remedies is that the fruit or vegetable makes the poop so undesirable that the dog will not touch it. Some of these additives seem to work in some dogs, but not all. Remember that if your dog is eating other dog's feces, adding something to their diet will not work. Adding enzymes to the dog’s food may also help. ProZyme, for example, is one popular and readily available brand. A similar home remedy is to add meat tenderizer to the dog's meals to stop coprophagia. Meat tenderizers contain an enzyme called papain that helps to more fully digest the meal, so this tends to support the notion that it is enzymes that may be lacking, not nutrient themselves. Before you try adding any of these things to your dog's food, consult your veterinarian about whether the particular additive is safe for your particular dog. Do not expect any additive to be a miracle cure. These things tend to work for the occasional dog, but chances are good that your dog will not be the one. If your dog tends to eat too quickly, slowing them down might help digestion. You can slow down their inhaling food habit by adding chew toys to their dog bowl, give their food in slow release food toys or specialized bowls that encourage dogs to slow down. If boredom is an issue, increase your dog's exercise and activity. More interactions, chew toys, and other interesting objects can help dogs that are suffering from anxiety and boredom. Also see Anxiety, Separation Anxiety, Boredom, and Compulsive Behavior, below. Some dogs love to raid the litter box. If this is a problem in your home, find a new location for the cat litter box. The easiest way to solve this problem is to place the litter box in a high location that your cat can reach but a dog can not reach. There are medications available for anxiety and compulsive behavior. Consult your veterinarian to determine whether your dog is suffering from one of these issues. Solving these behavioral problems may also solve other issues including your dog's insistence on eating poop. Try to avoid any harsh punishments when they poop in places that are inappropriate. Also avoid punishments when dogs do eat their feces. Shih Tzu dogs are very sensitive to this form of punishment and can worsen anxiety. Rather, reward when they leave their poop alone. A food reward can encourage the dog to stop their bad habit. A tasty treat always trump a poop snack. The training command, "Leave It" sometimes works to give you enough time to remove the poop, thus preventing him from eating his stool. To teach is command, you can either offer the command when the problem arises or teach the command in a neutral setting. Learn more about teaching "Leave It." Is Your Dog Eating Feces: Have You Tried to Treat the Stool? Use taste deterrents on feces. Some people find that finely ground black pepper, crushed hot pepper, Tabasco® sauce, and Bitter Apple® works. However, you must apply the deterrent consistently to all feces that your dog can access for a significant period so that he comes to expect that all feces taste horrible. You may need to use the deterrent weeks or even months, depending on the length of time the coprophagia has been going on. The real problem I have with this one is the effort it takes. If you are going to “treat the feces” why not just pick it up in the first place and dispose of it? A dog that is on a leash is less likely to eat poop or even show interest in their poop if their owner is on top of the situation. Even if you have a fenced in yard or garden, if you take your dog out to potty while on a leash, you can control his behavior. Use the leash not to jerk the dog, but simply to keep the dog from being able to reach the feces. Keep the treats out of sight. Use the command, "Leave It." and "Come." The instant the dog reaches you, praise the dog and give it a treat. Then back away from the dog, praise and give another treat for coming to you. At this point, you have taken the dog's mind off the feces. Go on indoors with the dog and come back out without the dog to clean up. Once you have good control and a good rapport with the dog, you can go ahead and clean up while the dog is still outside. As you set this habit more strongly through repetition, you will be able to do this with the dog on a long line, coming to you at the back door for a treat. Eventually you'll be able to do it without a leash on the dog. Keep up the same energy and level of reward, if you want the dog to keep responding! It sounds weird, but dogs prefer perfectly formed stools to munch on and will leave any feces that seem soft or runny. They will back away from any diarrhea that they see. One method that has be suggested is to add a mild stool softener to your dog's daily routine so that her stools are less appetizing. You be the judge on this one: Clean up half eaten feces or clean up diarrhea? Neither sounds appealing to me! Medical Problems Causing Your Dog Eating Feces? The best way to rule this problem out is to seek the advice of a veterinarian. If there is an underlying medical problem, the best way to treat a dog's poop eating problem is to treat the medical problem. This is a product my veterinarian always recommends and I have used it with some success. It is easy to use, just pour a little packet of powder over your dog's food. It works by giving the stool a bad taste so dog's will avoid eating it. Prozyme is an interesting product. It aids in digestive health by promoting the digestion of fats, protein fiber, and carbohydrates to maximize the nutrition from food. It also helps pets who have problems with poor nutrient absorption, excessive gas, dull hair coat, lack of energy skin problems, weight issues, and stool eating. While I haven't had much success using Bitter Apple on my dogs' stools, it works great as a deterrent for chewing. It is safe to spray on furniture, woodwork, doors or anything a dog may wish to munch on. You can also spray it on the dog's skin to discourage them from biting or licking their skin. While eating one's poop is not a major medical problem for your dog, there are some risks. If your dog is eating poop that contains parasites, there is an excellent chance your dog will acquire those parasites. If they eat their own poop that contains parasites, they will continue to reinfect himself. While rare, dogs that eat poop from other dogs who take medications, can absorb some of that medicine. Other issues that can surface is infections with bacteria such as E.coli and Salmonella. Certainly, there are things that you should never do such as rubbing your dog’s nose in the feces to punish him. This will not work and will likely cause your dog to be afraid of you and of leaving poop in a room. Secondly, you should not punish your dog for eating poop. Serious problems such as fear or aggression can often be traced back to physical punishments. In summary, solving and eliminating this behavior is not one fits the model that that one cure that fits all. But if you determine the cause, it is easier to discover a cure.